Cocina Poblana (Puebla Cuisine) is one of the most famous cuisines of Mexico, and attending a cooking class at the Sacristia de la Compañía in Puebla, Mexico with Chef Alonso Hernández provided me with the opportunity to learn the art of creating regional favorites of mole poblano, chalupas, salsa verde, salsa roja, and more. Buen Provecho! 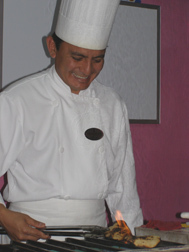 Sacristía de la Compañía offers 1, 3, and 5-day cooking classes that are offered with or without accommodations at the hotel, Mesón Sacristía de la Compañía, and since I had time while I was visiting Puebla in late October 2009, I enrolled in a 1-day cooking class. I love to cook and to learn new techniques and styles, so whenever I can, I take cooking classes with professional chefs to increase my skill level and knowledge of different cuisines. After a warm welcome to the students from Chef Alonso Hernández and his assistant, Lizbet Hernández Cásares, I settled back into my chair with my recipe booklet open, with pen, pad, and camera at the ready, as cooking class was about to begin. Lesson Number 1: Mole Poblana, a rich and spicy sauce that is made with chocolate, chile peppers, tomatoes, onions, garlic and plantains, needs to be made with three types of chiles, because without using the three different types of chiles, you do not have mole. The types of chiles used are poblana, sweet, sundried and smoked with mesquite; ancho, a dried sweet bell pepper, with a raisin-like smell; and pasilla, spicy and smoky and gives the sauce its flavor. Lesson Number 2: It is important to use Roma tomatoes when making mole. Lesson Number 3: Although there are three types of onions, white, yellow (used for soup), and purple (used for salad), it is the only the white onion that is used for making mole. 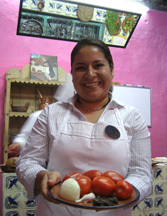 Lesson Number 4: Fruit is used in the making of mole, (now who would have thought of that? ), namely plantains, apples, pears, or even peaches, although the fruit is not all used at the same time. 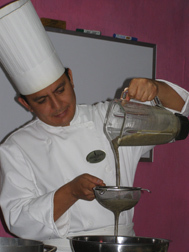 Using different types of fruit helps to create your own signature mole recipe. Lesson Number 5: Traditionally to make mole you needed to use cacao, sugar, cinnamon, vanilla, and many other spices, now it is more common to use Abuela chocolate (brand available in supermarkets and Latin American specialty shops), which incorporates all of these ingredients. 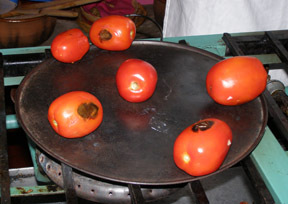 Technique 1: Roasting using a comal (a griddle or grill used in Mexican cooking) or a frying pan to obtain roasted, smoky flavor. 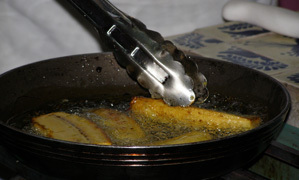 Technique 2: Frying with vegetable oil. 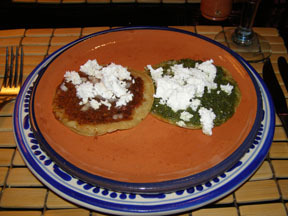 Traditionally, lard was used, although Mexico is now health conscious and vegetable oil has replaced the use of lard. Technique 3: Boiling to create the sauce. Roasting: Chef Alonso Hernández demonstrated the technique of how to roast the tomatoes, onions, and garlic on the comal and then had students each take a turn roasting ingredients. Roasting complete, we were ready to take the next step, removing the seeds from the chiles and then frying them. Frying: Apron on, I took my place at the stove next to Chef Alonso Hernández and learned how to quickly fry the chiles in the hot oil until they were golden inside and crisp, but not brown. Working quickly, I fried the chiles one at a time and set them on a plate to await the next step in the process. Boiling: The tomatoes, onions, garlic, and chiles were boiled with water until the chiles were soft. Frying: The plantain is peeled and cut in half and fried in a pan with oil until golden and then set aside. (If using apples or pears, leave the skin on, remove the seeds, and quickly fry). Burning: To give the mole its rich smoky flavor, it is necessary to burn a corn tortilla, and when Chef Alonso said to burn the tortilla, he meant burn the tortilla by placing it directly over the gas flame and turning it until it became black and actually caught fire. Although this technique was fine at the school, I think that perhaps it would be best to do this process outside on a grill so as not to set off home smoke alarms. Completely charred, the tortilla was now ready. It is interesting to note that corn tortillas are used in Cocina Poblana, whereas cuisine in northern Mexico uses flour tortillas. To make the first sauce: Add the fried plantains, the tortilla, and water to a blender and process until smooth. Strain into a bowl and set aside. The sauce will thicken as it sets. To make the second sauce: Put half of the boiled tomatoes and chile mixture into a blender, place the cover on, remove the center piece from the cover, and then place a heavy kitchen towel over the hole, so that the steam can escape. Puree until smooth, and then strain into a bowl. 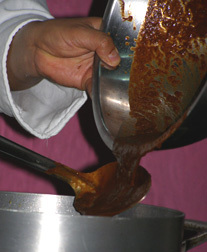 Frying the sauces: In a large deep pot, cover the bottom with oil, heat, and then slowly pour the tomato sauce from the bowl over a spoon to add to the oil, so that the sauce does not splatter. Let cook, and then add the plantain sauce. The sauce will be very creamy. The final step: Add finely chopped chocolate to the sauce and stir. The sauce will begin to change color as it boils. Add turbinado sugar (light brown granulated sugar) and salt, and simmer for 25 minutes. 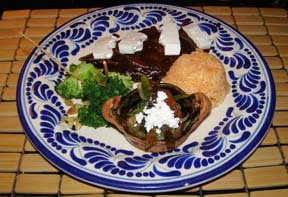 The mole poblano is ready to be served over chicken, turkey, pork, or over enchiladas, seafood, or even vegetables. 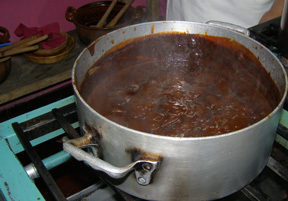 To prepare the mole sauce to keep for up to 6 months, continue to cook the sauce for additional 20 minutes. After 45 minutes, you will have a mole paste that may be reconstituted with water or chicken broth when ready to use. We also learned how to make another Cocina Poblana specialty, Chalupas, which are tiny corn tortillas that are lightly fried in oil, covered with Salsa Verde (green sauce), Salsa Roja (red sauce), or mole, and then topped with shredded beef, chicken, pork, or sometimes cheese. We also learned how to make Salsa Verde and Salsa Roja, and also to make Jamaica Agua Fresca, (hibiscus flower water) a traditional drink made from dried hibiscus flowers, sugar, water, and ice. Appetite thoroughly awakened after watching, cooking, and smelling the tantalizing aromas during the cooking class, it was time for the final lesson, tasting and enjoying the rewards of our labor, eating our lunch in the restaurant. Sitting with my fellow classmates, we toasted each other with our hibiscus water and to our success at learning the delicious art of cooking Pueblan cuisine. 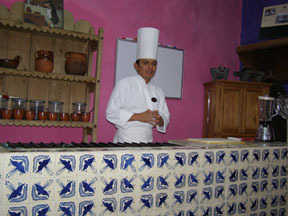 Chef Alonso Hernández graciously shares his recipe for Mole Poblana in the Chefs' Recipes section. 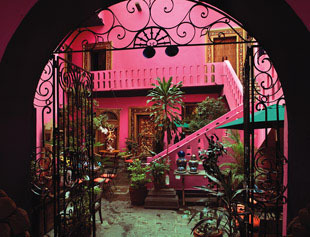 Read about Sacristía de la Compañía in the Restaurants section. 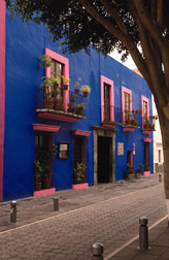 Please read other articles on Puebla, Mexico in the Destinations, Hotels and Resorts, Restaurants, Chefs' Recipes, and Arts sections.